The following list of PDF maps can be viewed online, downloaded or printed for free. These maps are provided as-is with no assurances as to accuracy, completeness or appropriateness for intended use. All maps are protected by copyright. You will require Adobe Acrobat Reader to view these maps. If you do not currently have Adobe Acrobat Reader installed on your computer, you can download a free copy of Adobe Reader here. This yearly Map Book publication includes over 50 pages of rural maps, urban maps, places of interest listings and a road name index. 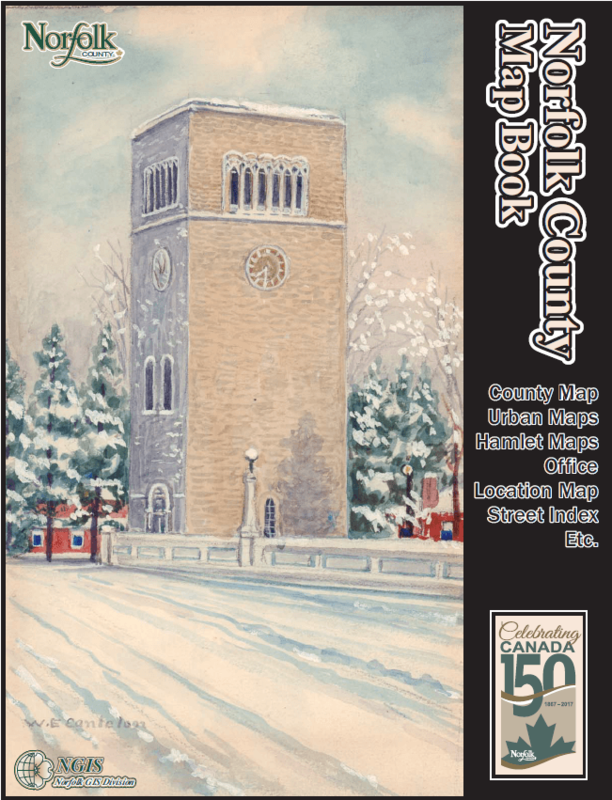 Download the current Norfolk County Map Guide in PDF format. This basic 8.5″ x 11″ black and white map shows the roads, towns and hamlets within Norfolk County. This 28″ x 30″ black and white map shows the roads, towns, address ranges, lots and concession within Norfolk County. This basic 8.5″ x 11″ colour map shows the roads, townships, towns and hamlets within Norfolk County. This large 28″ x 30″ colour map shows the roads, townships, towns, lots and concessions within Norfolk County. This map highlights the location of Norfolk County Offices within Simcoe, Delhi and Langton. This map identifies the location of Norfolk County in context with the eastern portion of North America. This 28″ x 30″ colour County map shows roads and associated address ranges. This 11″ x 17″ map shows road names and address ranges for the western portion of Norfolk County. This 11″ x 17″ map shows road names and address ranges for the eastern portion of Norfolk County. This map shows the location of Places of Worship within Norfolk County. This map shows the location of schools within Norfolk County. Small 8.5″ x 11″ map showing heritage railways within Norfolk County. This map of Norfolk County shows Townships, lots and concessions and is dated 1968. This Norfolk County map has been created with a retro style and contains many of the smaller historic hamlets. This map was created by the Economic Development Department of the Regional Municipality of Haldimand Norfolk in 1988 for tourism purposes. This Norfolk County map was created in 1856 by George Tremaine. It details land ownership at the time. This map highlights the 5 Counties within the South Central Ontario Region or SCOR. This map shows the By-Law Enforcement Service Areas and associated contacts within Norfolk County. 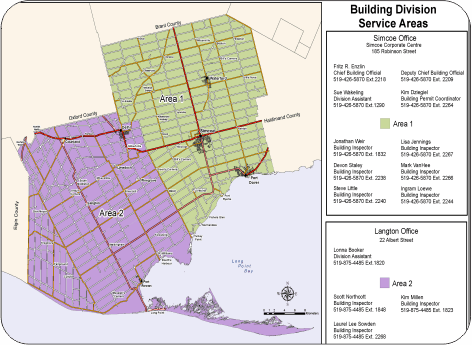 This map shows the Building Division Service Areas and associated contacts within Norfolk County. Map showing the locations of Wind Turbines within Norfolk County. 8.5″ x 11″ map highlighting trails within the Backus Woods of the Backus Heritage Conservation Area. 8.5″ x 11 map highlighting trails within the Brooks Conservation Area. 8.5″ x 11″ map showing the Delhi Rail Trail from Delhi to Simcoe. 8.5″ x 11″ map highlighting trails within the Hay Creek Conservation Area. 8.5″ x 11″ map showing the Lynn Valley Rail Trail from Simcoe to Port Dover. 36″ x 36″ map showing Rail Trails within Norfolk County. 8.5″ x 11″ map showing the Norfolk Sunrise Trail through Simcoe. 8.5″ x 11″ map showing the Waterford Heritage Trail From Simcoe to Waterford and north to the County of Brant. 8.5″ x 11″ map of the town of Delhi showing points of interest. 11″ x 17″ map of the town of Port Dover showing points of interest. 8.5″ x 11″ map of Port Rowan showing points of interest. 11″ x 17″ map of the town of Simcoe showing points of interest. 8.5″ x 11″ map of the town of Waterford showing points of interest. For other towns and hamlets please see the County Map Book.